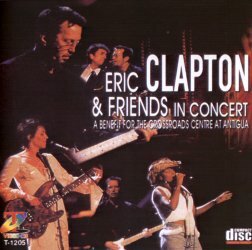 The interplay with Sanborn and Sanborn's stepping out on sax makes the song great, Clapton's one of the best improvisers on guitar in the world , not a Cheryl Crow fan, but she seems alright, good voice, good vibes on that song. I am going to get the DVD! This is OK, not sure if a 7 is too high. Some good parts...Nathan East watching Mary Blige from behind...Not a Sheryl Crow fan, she seems too enamored of Clapton during the concert to be effective...should be a performer, not a fan or whatever (not sure if they were an item at the time. Bob Dylan is a hoot, his suit and tie are something else, probably wearing white socks...a style maven he ain't to say the least, his singing with Clapton is something to behold, a rendition of Crossroads like none you've ever seen. I think Dylan is what pulls this up to a 7.